The economy of Mongolia is poised for explosive growth from the mining of minerals found under its iconic steppes. Hong Kong, China (CNN) -- As the last of 33 trapped miners were pulled to the surface in Chile, a group of bankers, government officials and mining company executives gathered to talk about the coming minerals explosion in Mongolia. "We are following the economic model of Chile," said Dashdorj Zorigt, Mongolia's minister of mineral resources and energy. "There are a lot of lessons we can learn from the mine accident." The celebrations on the Atacama Desert in Chile, the toxic sludge coursing through the streets Devecser, Hungary, and the economic hopes of the people on the steppes of Mongolia share a common link -- the world's growing hunger for dwindling resources plumbed from the ground. "Safety has always been an issue ... it almost goes without saying," said Chris Hinde, editorial director for Aspermont UK, publisher of Mining Journal and other mining industry publications. "How to mine without polluting, ruining lifestyles, fitting in with the existing community are the real challenges." Video: Blood on mining executives' hands? As mining commodities enjoy boom times, pressure is growing to build the world's supply of coal, bauxite and rare earth metals in increasingly difficult locales. 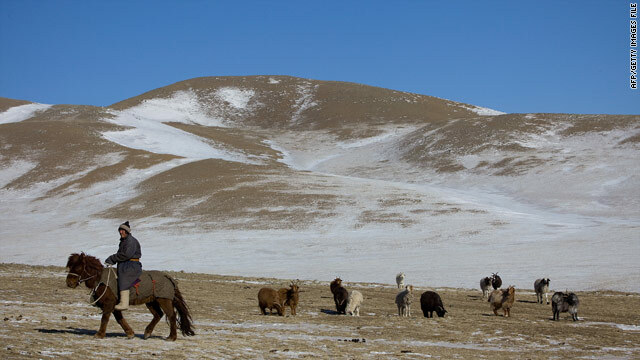 As safety and environmental risks rise, so does the allure for developing economies like Mongolia to harness the world's growing minerals appetite. "We expect to be one of the top-performing economies in the next few years, and this is mainly due to mining," Zorigt said. A landlocked nation sandwiched between China and Russia, Mongolia is better known as the birthplace of Genghis Khan than as an economic powerhouse. But two mines under development -- expected to become the world's largest operating mines of coking coal and copper -- will change that. Mongolia's economic output is projected to nearly quadruple to $23 billion by 2013, according to a Renaissance Capital report. Zorigt projects the nation's per capita income -- which now stands about $3,200 a year -- will grow to $5,000 by 2015 and $12,000 by 2021. But a commodities boom in developing nations is often beset by the "Dutch disease" -- a lopsided influx of capital that causes currency and prices in the country to inflate without trickling through to the rest of the economy. "Principally are the socio-economic challenges ... the role of mining in transforming an economy," said Nigel Finch, senior lecturer at the University of Sydney's school of business and economics. "There's a tremendous amount of risk associated with that. "But when they plow that back into their own nation to do the right sort of things that one would imagine -- building roads, hospitals and all the rest of it -- they bring home so much cash in one go it has this enormous splash effect on the economy," Finch said. Often it's not the obvious socio-economic impacts that are hardest for mining companies, said Hinde of the Mining Journal. "For example, if you build a mine in some parts of Africa, you obviously want to employ local people. The problem is the structure of a lot of African tribes is seniority comes with age," Hinde said. "Mining at a stroke destroys centuries of culture, because the young men are the men who have salaries and making good money -- how on earth do you stop that, because they're the ones driving the trucks and equipment? But then they effectively almost take control of the tribe, because they've got the money," Hinde said. The more obvious environmental concerns are associated with the toxic sludge disaster in Hungary, where a pond of by-products from processing minerals -- known as a "tailings dam" -- gave way. "A lot of the press called it a 'factory,' but it was a mine. ... it was the waste from an aluminum plant, which is on-product of a bauxite mine, so it was a mining issue," Hinde said. The Chilean economy was built on copper mining, but avoided becoming a victim of Dutch disease. "Copper transformed the Chilean economy and Chile has had enormous social benefit from mining ... there's enormous wealth that's being created there and that's fed back into the economy," Finch said. The rescue in Chile illustrates the safety issues in mining and the market pressures driving operators to get minerals out of the ground while prices are high. The small-time operation at the heart of the Chile accident was mining copper -- which hit a 27-month high in prices this week -- and gold, which hit record prices this year as it nears $1,400 an ounce. "All mining is dangerous: It's enormous equipment, it's explosives and it's unskilled or semi-skilled labor," Finch said. "There's obviously going to be some occupational safety hazards. Where you've got a workforce that's desperate to make a dollar, the enforcement is going to be more lax. China is an example of that." Accidents killed 2,631 Chinese coal miners in 2009, according to China Daily. The most dangerous year on record was 2002, with 6,995 deaths. By comparison, the United States had 34 mining deaths in 2009, a record low for the country. "Mining is cyclical. Mines will open and close depending on where commodity prices are," Finch said. "When you've got gold trading around $1,350 an ounce and the cost of extraction is well under $200 an ounce, then you rip it out of the ground."